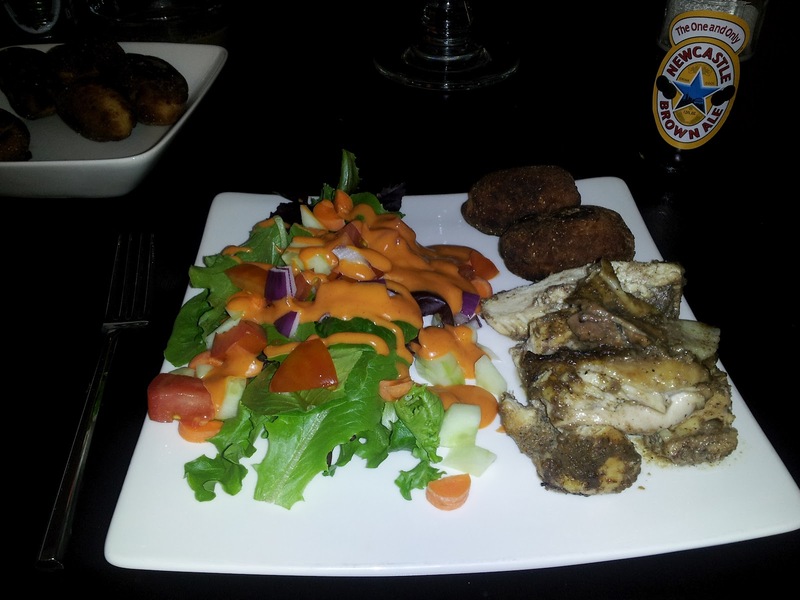 Tried cooking some jerk chicken and festival last night, reviving our "cuisines of the world" experiments from last year. The chicken turned out pretty good - definitely tangy - though our experiment with festival (a Jamaican fried bread) was less than successful, mostly, I think due to frying in a little oil instead of deep frying, and frying too hot. Our result was a little bit too hard and somewhat burned on the outside. Served that up with a salad, and it was pretty good. But the best part of the meal? Well, that was our dessert. Pineapple upside-down cake. It really ended up pretty good. 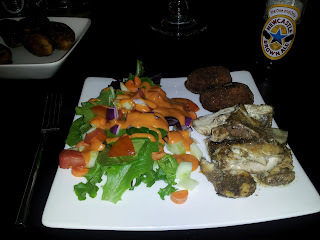 All of the recipes came from this Jamaican Travel website, and are listed below. Jerk Chicken - we did this pretty faithfully, but had to use 3 jalapenos instead of the 6 scotch bonnet peppers, and used 4 chicken thighs and 2 breasts instead of a whole chicken. Could have used more peppers, I think, but was pretty good. Festival - Again, deep fried over lower heat, this might have been edible. Could use more vanilla AND sugar if you want to sweeten it up - otherwise it was kind of like a naan ball. 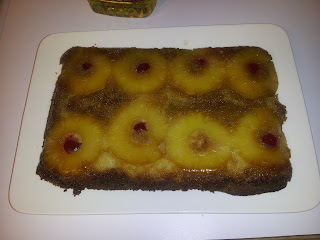 Upside-Down Cake - This turned out just fine - if anything at all, we could have used a slightly smaller pan (note the overlapping pineapples in theirs, and the side-by-side in ours) and gotten a thicker cake, but it was still good.